Updated with a new afterword and including a selection of key documents, this is the explosive account of how the Bush administration makes policy on war, taxes, and politics -- its true agenda exposed by a member of the Bush cabinet.This vivid, unfolding narrative is like no other book that has been written about the Bush presidency. At its core are the candid assessmentsUpdated with a new afterword and including a selection of key documents, this is the explosive account of how the Bush administration makes policy on war, taxes, and politics -- its true agenda exposed by a member of the Bush cabinet.This vivid, unfolding narrative is like no other book that has been written about the Bush presidency. At its core are the candid assessments of former Secretary of the Treasury Paul O'Neill, the only member of Bush's cabinet to leave and speak frankly about how and why the administration has come to its core policies and decisions -- from cutting taxes for the rich to conducting preemptive war.O'Neill's account is supported by Pulitzer Prize-winning journalist Ron Suskind's interviews with numerous participants in the administration, by transcripts of meetings, and by voluminous documents. The result is a disclosure of breadth and depth unparalleled for an ongoing presidency. As readers are taken to the very epicenter of government, Suskind presents an astonishing picture of a president so carefully managed in his public posture that he is a mystery to most Americans. Now, he is revealed. Former Secretary of the Treasury Paul O'Neill's account of his time with the Bush administration.A first person account that had some interesting insights. For me, this was a slower read since the subject of politics, and especially taxes, can be a bit dull. A lot has been written about the Bush administration since this book was published, and I imagine there are more in depth looks at the administration.I read this book because it was on the Gilmore Girls reading challenge. This was one of the first reports from life inside the Bush White House. A lot of what was shocking then has become well known since. 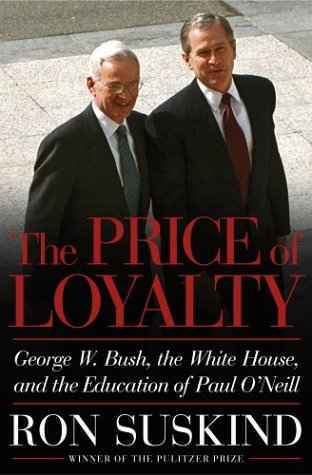 However, it's still an eye opener to read about how a long-time Republican (O'Neill) with a lot of government experience was astonished by the Bush administration. In his first interview with Bush he expected a lot of questions. Bush said nothing. There's stuff about Greenspan, early (pre 9/11) discussions about invading Iraq etc etc etc. A welcome confirmation of my gut feelings about the current administration — I'm not going crazy! This is an informative read for anyone who noticed the major discrepencies between "news" as presented by the White House propoganda organs (CNN, FOX News) and information from alternative sources since the summer of 2002. Also very instructive as to how those large corporate contributions to W's campaign coffers reap practical results. How Bush screwed up the treasury department and turned a Clinton budget surplus into a huge deficit. How they gutted the treasury for no good reason. How everything was about politics and rewarding the base. How competent people (Paul Oneill) were thrown out of the Bush administration. How decisions were made without any regard for facts or reality.Why it really matters who we elect as president. Bush had the unfortunate penchant for choosing the most distinguished advisers, but then taking no time to follow the logic or policies they suggested. O'Neill is one of the most highly qualified treasury secretaries we have ever had, and, if his wisdom had been allowed to guide the economy, we might not be in the same situation that we are currently facing. This was one of the first expose-style books from an ex-member of Bush's cabinet. Unfortunately, it was largely overlooked by the American public which was still under the hypnotic spell of W. Thank god that's over! If only people had payed more attention to books like this one, we might have booted Bush out in '04. Read this a long time ago, but I find myself thinking about Paul O'Neill's views a lot. He's a lifelong Republican, so I don't agree with him on everything, but he's nearly idealistic about his views on the value of an ethical bureaucracy. I find his thinking that secrecy is almost entirely pointless very compelling. It's a really solid story and book. I may not agree with O'Neil's old conservatism, but jesus, this many has integrity. An excellent window into W's executive style (passive and unquisitive). In no way did he bash Bush- which is what I liked---but be reading the facts--you are totally astonished at how unleader-like and halfhazardly our President #43 operated. Paul O'Neill was a brilliant Secretary of the Treasury in Geo. W. Bush's first term, but was forced out because he refused to be a 'yes' man. Had he been able to stay in his position throughout the years of that administration, and had he been able to influence the policymakers, the country likely would have been able to avoid many of the financial debacles of the last years of Bush's reign. Gripping read about former Secretary of the Treasury, Paul O'Neill's experience of the first two years of the Bush Whitehouse. Fascinating and did not feel dated to me. This has been on my TBR shelf for about seven yearsyay for clearing one out! But, now has bumped up another Suskind book I owned but haven't read and put at least two more books on the TBR list! Non ho potuto dare più di 5 stelle per questo libro, gli avrei dato tranquillamente 5+. Veramente esilarante, l'amministrazione Bush messa a nudo svelandoci in mano a quale cricca è stata l'Ameriaca prima ed il mondo intero poi. Libro assolutamente da leggere e se lo si fa dopo avere letto Osama di Jonathan Randal è veramente il massimo.